We've made it!! 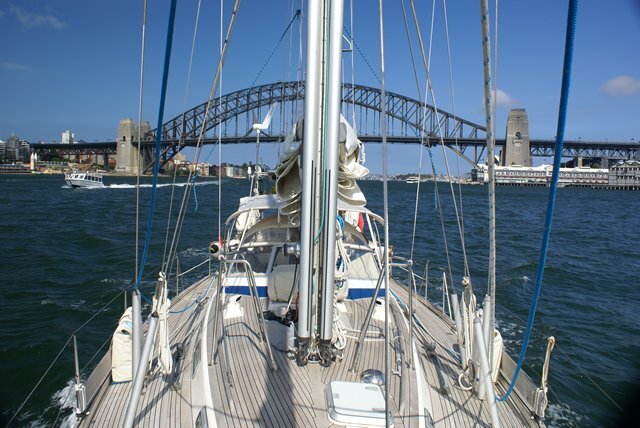 When setting out 4 1/2 years ago our aim was to sail to New Zealand and then on to Australia to sail past the Opera House and under Sydney Harbour bridge. Well we did it yesterday! 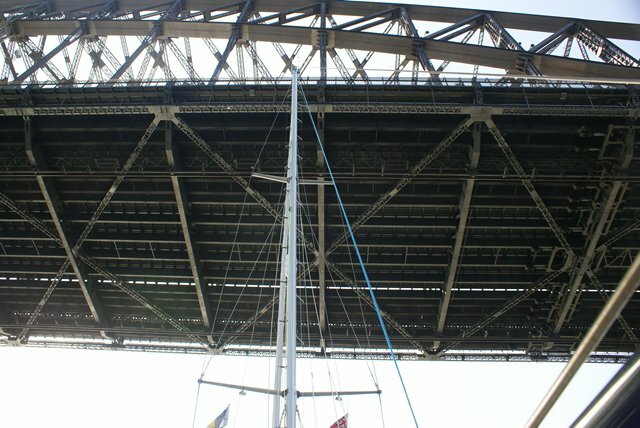 Went past the Opera House and under the bridge. 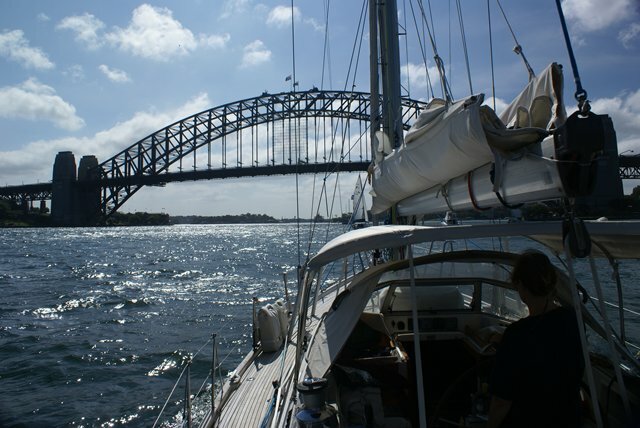 Strictly speaking we didn't sail under the bridge, we motored - the winds came up and it was a trifle busy with other boats, ferries, oil tankers, tugs and several yacht races - you name it and it seemed to out there yesterday! 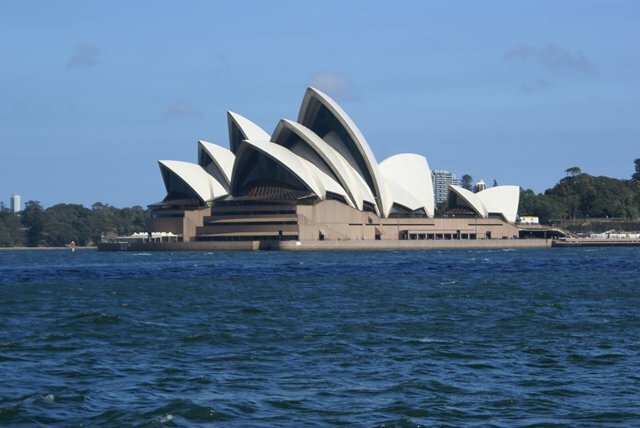 But the clouds finally cleared and the Opera House and city looked a picture against the blue sky. We are now moored on a buoy off the Woolwich marina which is 2 miles west of the bridge so we had to go under the bridge to get here. And it's in sight of the bridge, so it should be good for the New Year's Eve fireworks. 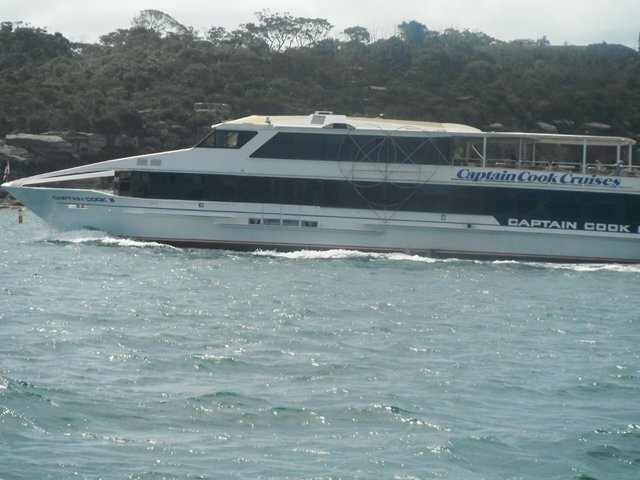 We have this buoy booked until 6th January, so hope to be able to see a lot of Sydney while we're here. 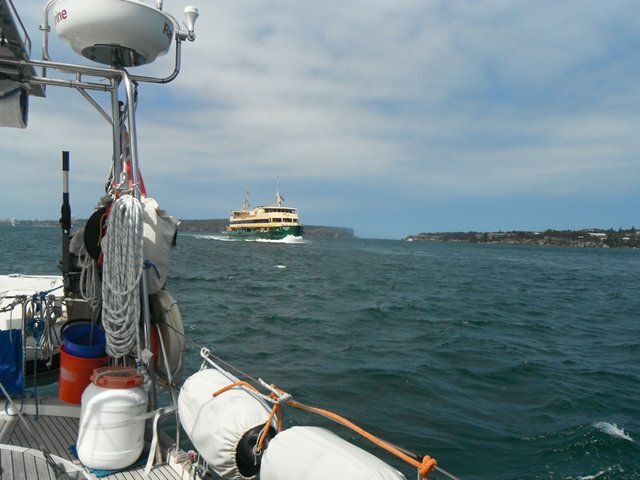 After that it's back to our buoy in Pittwater for at least another couple of months. 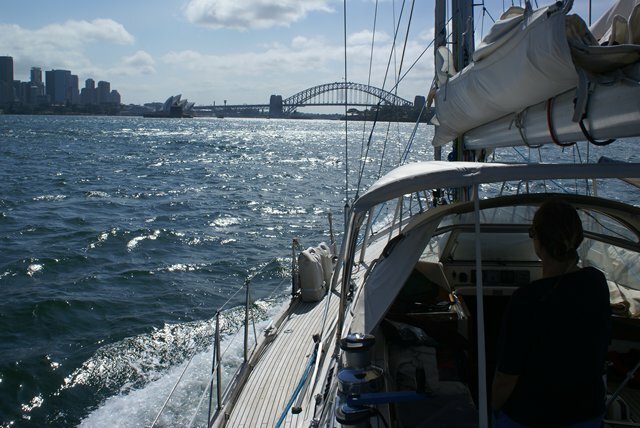 The passage down from Pittwater was 32 miles with little wind. 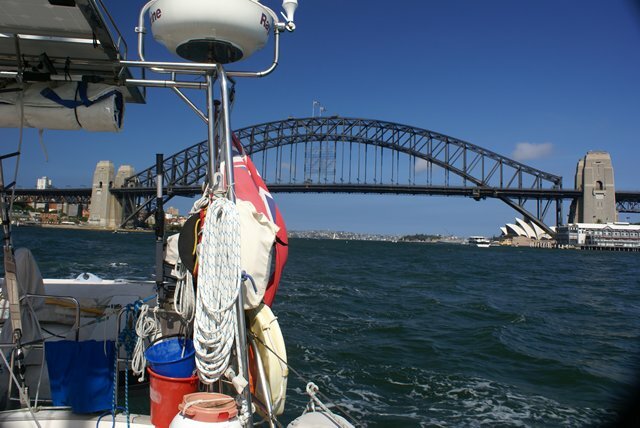 So it was a case of motorsailing most of the way, although the motor was turned off for a couple of hours and we ghosted along at 3 knots while running the generator and watermaker to fill our tanks before entering Sydney Harbour. Generally we avoid running the engine and generator at the same time - too many mechanical things all going at the same time! We need the generator to run the watermaker (as it's 230 volts) and so run it when sailing, or if no wind we're quite happy just to drift for a hour or two, as long as we have the time and sea room. The watermaker makes 110 litres an hour, so an hour or two every so often is all it takes to keep the tanks full (680 litres in all). Our friends Jackie and Jake from yacht Hokule'a are berthed in the Woolwich marina, having booked it a long time ago. It's only a small marina, with no more than 25 boats. 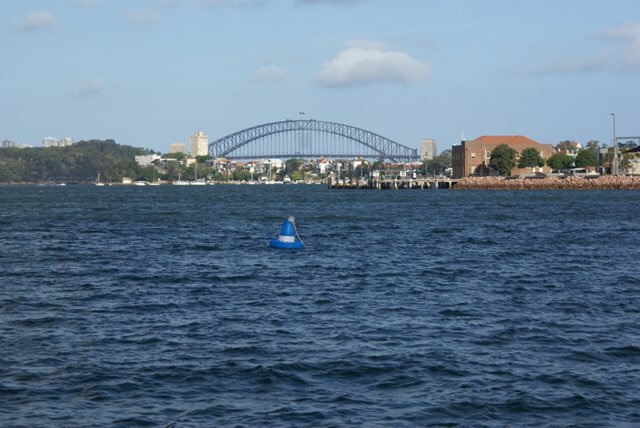 Our buoy is no more than 50 yards or so from the marina pontoon which means its very easy to get ashore. 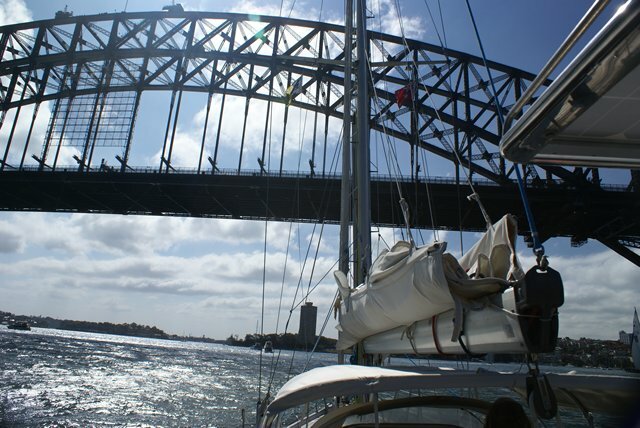 Marina berths in Sydney harbour for Christmas are hard to come by and expensive. 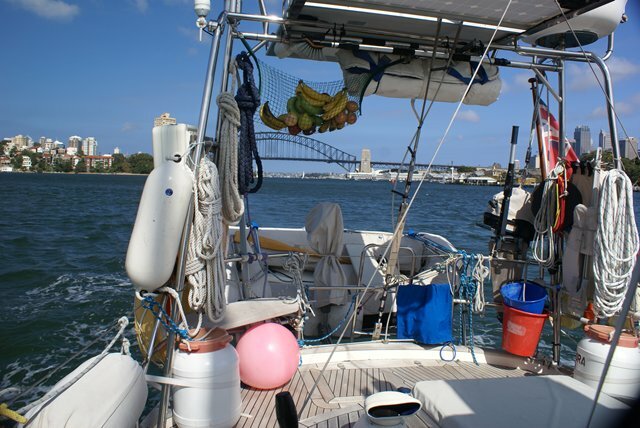 One marina that did have space quoted $800 (about £540) for just one week! All manner of water traffic comes past us during the day including regular commuter ferries, sightseeing boats, fishing boats, pleasure boats (gin palaces as we would call them back home) and yacht races. So it's interesting to sit and watch it all go by, but there can be a bit of a swell on the water as a result. 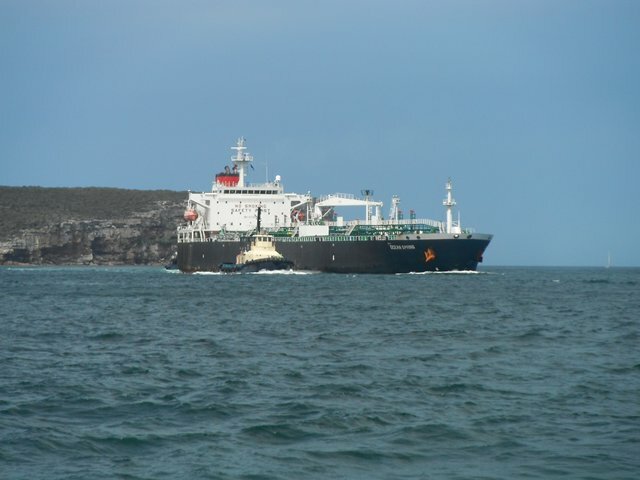 But Aurora B is a heavy boat and we rarely feel it down below. It all quietens down in the evening and over night. 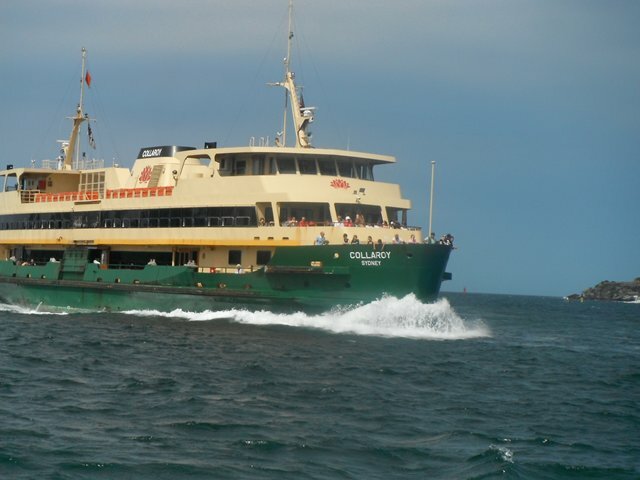 So this year the aim is to spend Christmas Day on Hokule'a with Jackie and Jake and about 8 other cruising friends who are either already anchored in other bays not too far away or are coming down from Brisbane by car. 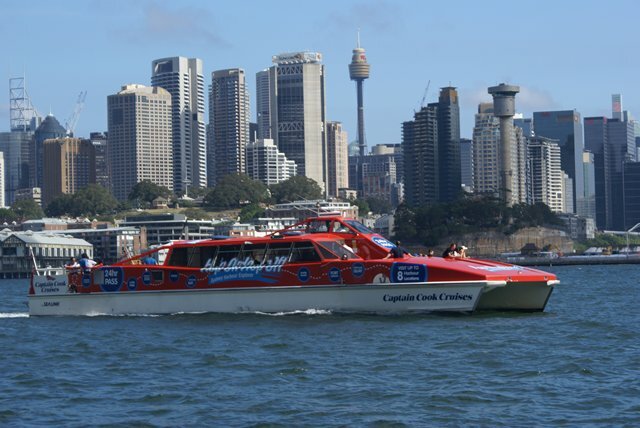 Several boats have decided not to sail any further south than Brisbane so they don't have to fight the south going current for 450 miles to get back north next year. 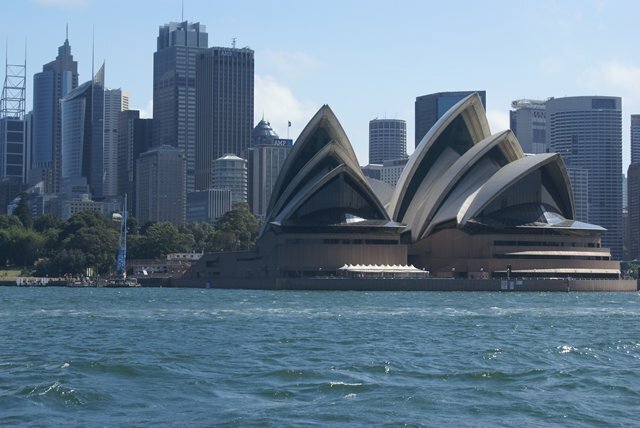 It's a bit of a rest day for us today and then it's off to explore more of Sydney and do more Christmas shopping. Everyone is bringing something for the Christmas lunch - some cooking part of the main meal and others preparing desserts. Fingers crossed that we have good weather. If not it's going to be quite crowded below! 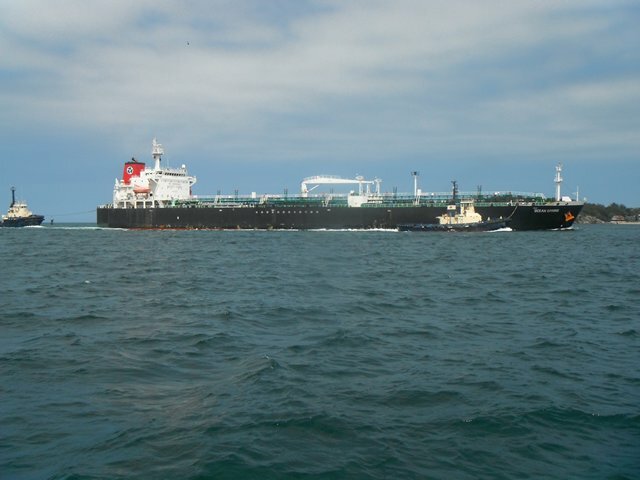 slow down to pass ropes to the 2 tugs that came out to meet it and we got out of the channel just in time. chased a number of other boats to get them out of the way. 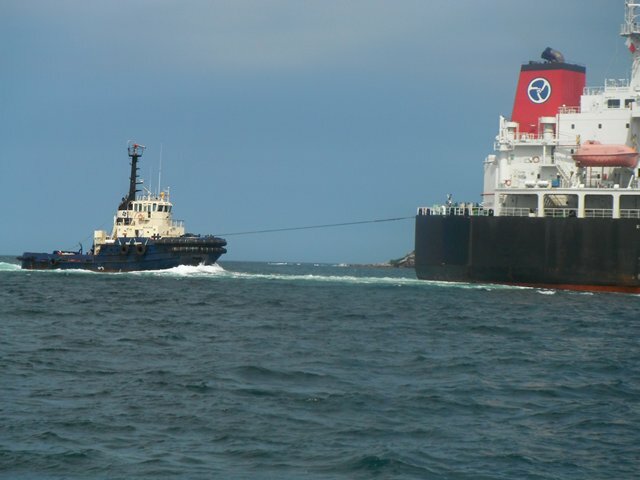 A tug at the back to help it round some of the tighter corners. And at the same time on the other side, this roared passed. 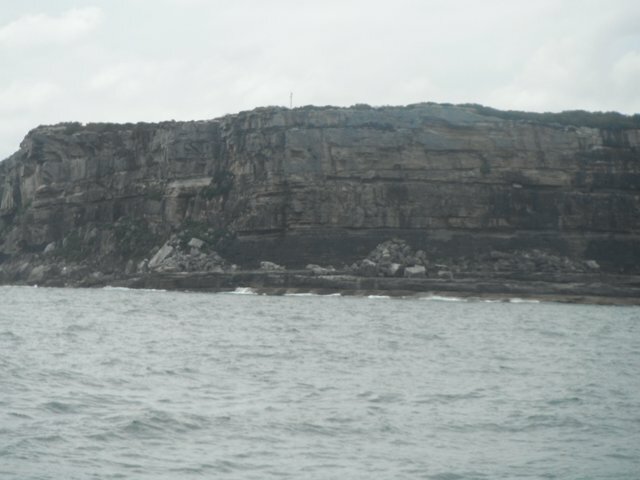 And if that wasn't enough to keep us on our toes, the Manly ferry came steaming up behind us. They travel faster than you think! 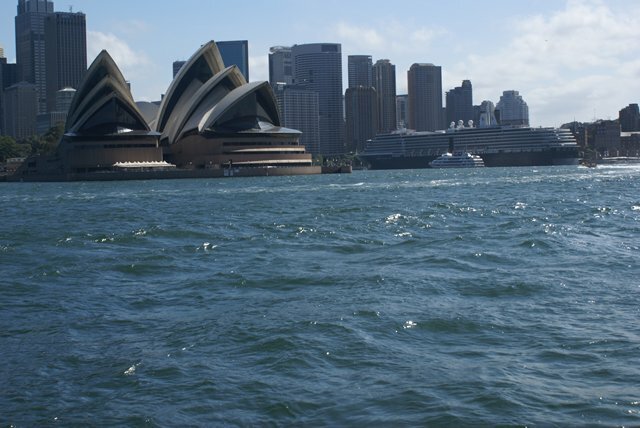 But after a few twists and turns the city, the Opera House and Bridge are in sight. 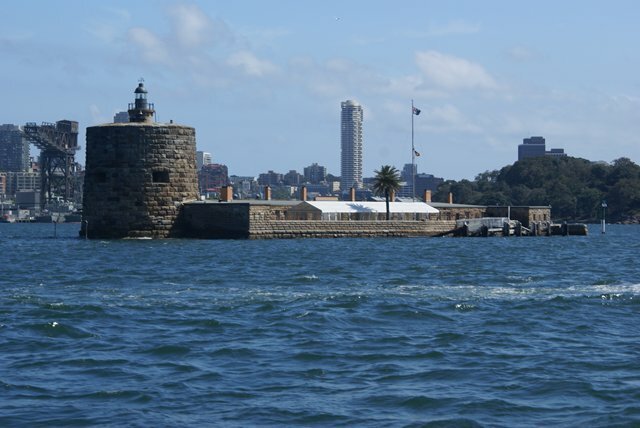 Fort Dennison, on a small island in the middle of the harbour. 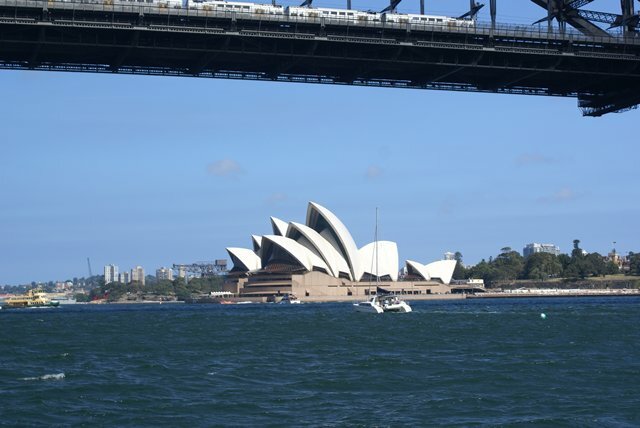 Eyeing up the bridge as we approach the Opera House. 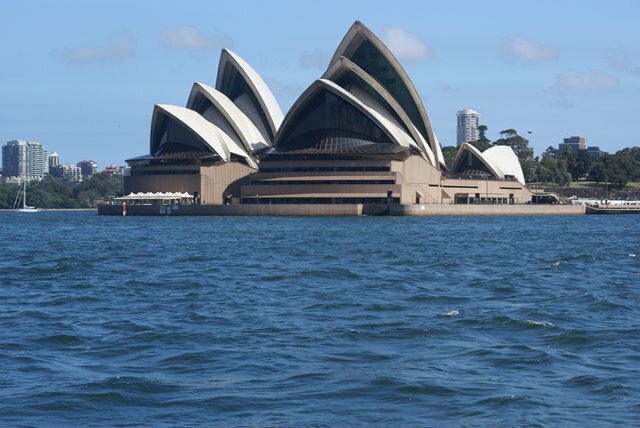 The huge cruise liner gives some scale to the Opera House and city buildings. 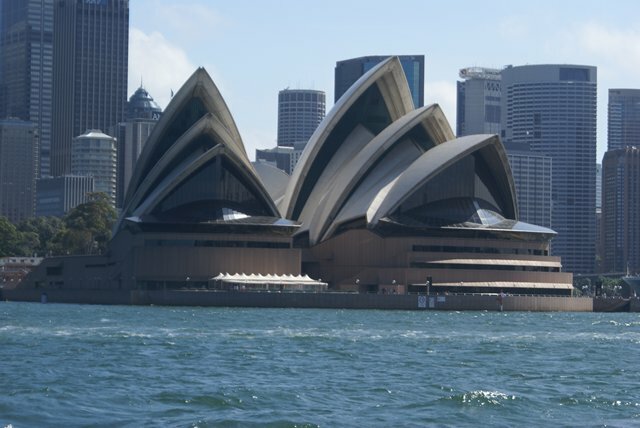 The Opera House is passed, now on to the bridge. 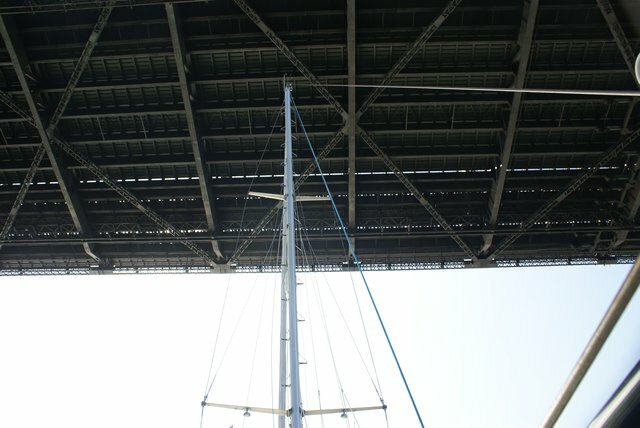 Will we fit under it? Of course we will, but it's very deceptive when looking up. Looking back giving a side view of what it looks like. The bridge is both for cars and trains - one is passing across as we look back. but there's no rush to make any decisions. That can wait until next year! House and bridge are about 5 miles inland. care about creating wash here! We're here! 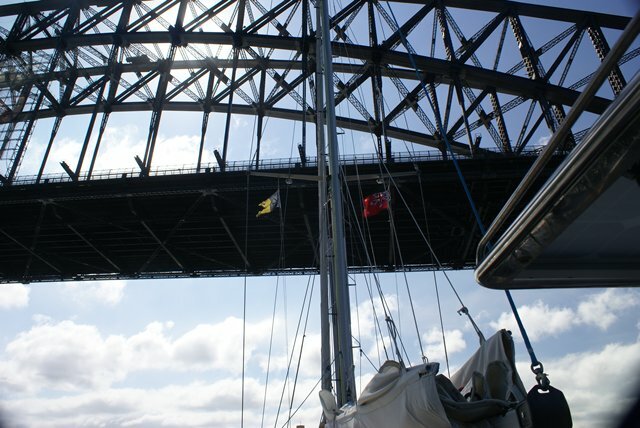 The view of the bridge from our mooring buoy which is about 7 miles inland.